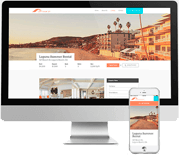 When you create a beautiful new website with all of the features that your employees, tenants, and owners have asked for, you want people to use it. Driving website traffic for property management websites can be a challenge and frustration for property managers, but it's a problem you can solve. It may seem simple, but rental advertising works. Our turnkey digital marketing solution is designed specifically for single family. Use Propertyware to execute geo-targeted campaigns, ads, and keywords to generate qualified leads quickly. Track your campaigns with professional reporting and monitoring tools to ensure success. We also offer ongoing campaign management and will refine copy and keywords to give you an edge over the competition. You can post your advertisements on social media venues such as Twitter and Facebook, but did you know that you can do much more? According to Entrepreneur Magazine, "by installing a Facebook tracking pixel on your site you can continue to market to customers who have visited your site." You can also move your email lists to Facebook or Twitter to create customer audiences that you target with mobile-friendly advertising. Is SEO dead? No, it's alive, although it may not look the same as it did years ago. Your goal is to hit the first page of search engine results for your leads' queries, since according to Property Management Insider, "92 percent of Internet search engine users never look past the first page of search results." Understand the search keywords that your visitors are using and use them on your pages, images, and headings. Consider developing landing pages that are dedicated to a specific keyword or a particular audience. Using Google Analytics, track leads' response to your website and use this to refine your keywords. Once your visitors are on the site, increase their interaction. Provide an online portal where your prospective tenants can take a look at properties and submit a rental application. Once your leads become tenants, they can pass on online property listings and applications more easily to their friends as well. Today's world is a mobile world, and many of your prospective tenants will access your site on their mobile device. If your site doesn't translate well to mobile, they'll move on to one that's less clunky. You may not have the time or funds to set up an entire mobile-friendly website from scratch, and you don't have to do so. With tools like Propertyware's turnkey digital marketing, you can morph your existing website into one that works on mobile devices. Are you looking for a way to build new streams of traffic on your property management website? Propertyware can help give you the numbers you'd like to see: our digital marketing tools result in 22 percent more qualified traffic and 6 percent increased engagement. Give Propertyware a try: get pricing today.